The druid’s trees are dying. He says the roots are reaching down in the deep, right to the old sewer system that runs under the city. Something is happening down there and it would be great if you could prevent the destruction of the rare and precious trees before it’s too late. 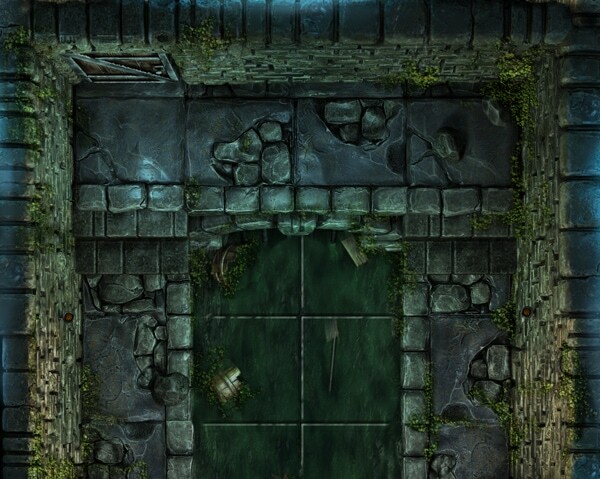 Play an adventure with the hooks we provide or build your custom sewer system! What can be more exciting than getting under the city and crawling around in its waste? It’s full of joy and adventure, isn’t it? And sometimes, it’s necessary. The druid’s trees are dying. He says the roots are reaching down in the deep, right to the old sewer system that runs under the city. Something is happening down there and it would be great if you could prevent the destruction of the rare and precious trees before it’s too late. The size of this map is 36 by 24 inches but you’ll get something new if you buy this set. This is no mere map; it’s structured from 6×6 inch tiles which has a lot of value! “Fog of war” on your tabletop! Without any accessories, blanket, paper sheets or anything you’ve used before to hide undiscovered areas. You only have to place the tiles that are visible for your players. This way you can reveal the dark secrets of the map during the adventure, just like a “fog of war” system. I’ve designed this map to help you easily manage your adventure, the main rooms and areas fit the borders of the tiles. Most of the tiles are seamless at their border. I will mark these tiles for you in both the printable PDF file and in the JPG files in case you want to use them online. This means if you want to expand this map or you would like to use different layouts, you only need to print out more map pieces and tiles, to build up another sewer system. Make the map fit to your story easily; you don’t have to play on a fixed layout, which is the disadvantage of most maps. There are special and unique areas that you can lay down only to next to each other but every other tile can be mixed with each other. Cut-out bridges, boxes, barrels etc. that you can place on your map. Area descriptions and a storyline idea to help fire up your imagination and help you create your own adventure. This set will not do the hard work for you. As a Game Master you have a lot of work, outlining the world and the adventure, populating areas, making NPCs more believable and taking control over the story and team. This is what this product will not do, because it is not a pre-written adventure you can follow step by step. But I’m sure the diverse areas, detailed graphics, area descriptions and those few adventure hooks you could use will provide a lot of help in the harder parts of this wonderful job. It’s also possible to bend this map to your own original concept. This set is including now altogether 64 map-tiles (32 map pieces and 32 mixable sewer-system tiles) with vortexes, bridges, doors, corpses, empty areas, bandits and more! The set is also including PDF files converted with custom CMYK profile that is better for most printers and use about 30% less black ink. Please print out a test tile from both versions before you print the whole PDF to check the result. Printed tiles are available via DriveThruRPG ($27). You will get 50 double-sided map-tiles! Buy it once and use them for any adventure! The tiles are available with two sides. One side is the original and the other side is an alternative version, so you don’t have to change your story to fit the tile’s content.